However! Now that the true winter has put the building to the test – unfortunately one area is far from dry. Indeed dampness glistens upon the inside wall of the northwest gable & seeps into the edge of the floor. As a result, this single area needs to be sealed as soon as possible. A few consecutive dry days is essential, yet an extremely unlikely prospect given the nightly storms of late! 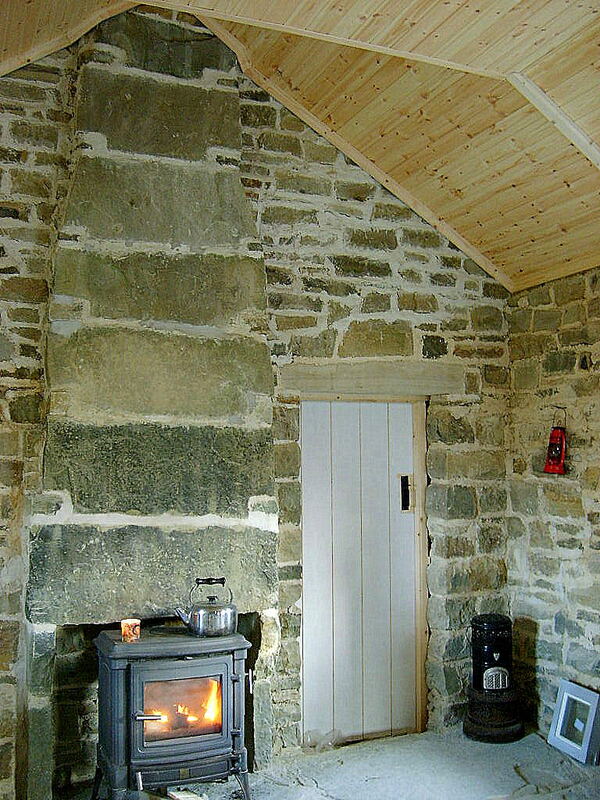 Posted in Cottage, HeritageTagged damp gable, internal door, porous stone, seal for stone, tongue and groove cieling, winter stormsBookmark the permalink. 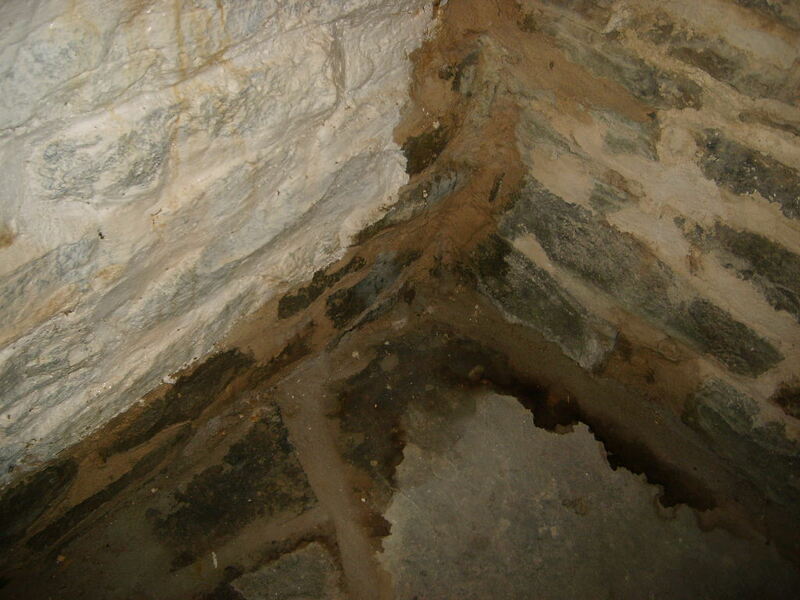 I’m sure there are limewashes with special additives you can use to help with this damp problem. I take this opportunity to send best wishes for 2014. With the wisdom of hindsight – I should’ve saved that older stone for use on a less critical exposure! As it transpires, this batch of stone was already reclaimed from a yet older, ancient cottage. Quite a few of those stones are saturated with centuries of turf soot, which weeps in brown trickles down the wall. Yes – I’ve found a product which claims to waterproof without negating the stone’s breathability – but not sure at this juncture what exactly it is composed of. Wishing you too, the best for the coming new year my friend. Ouch! Sorry to hear a damp patch has developed. Was the older stone more porous? What remedies are available to you at this stage, when you get some dry days? Despite my knowing that this gable was kinda sorta a wee bit dampish – it really took the full glory of relentless rain ( not heavy, but that spritzy and terribly WET variety) – to reveal the horror of water running down this inside wall. The old stone is considerably more porous (I now know!) and on all other parts of the building – where newly quarried stone is used – the walls are bone dry. 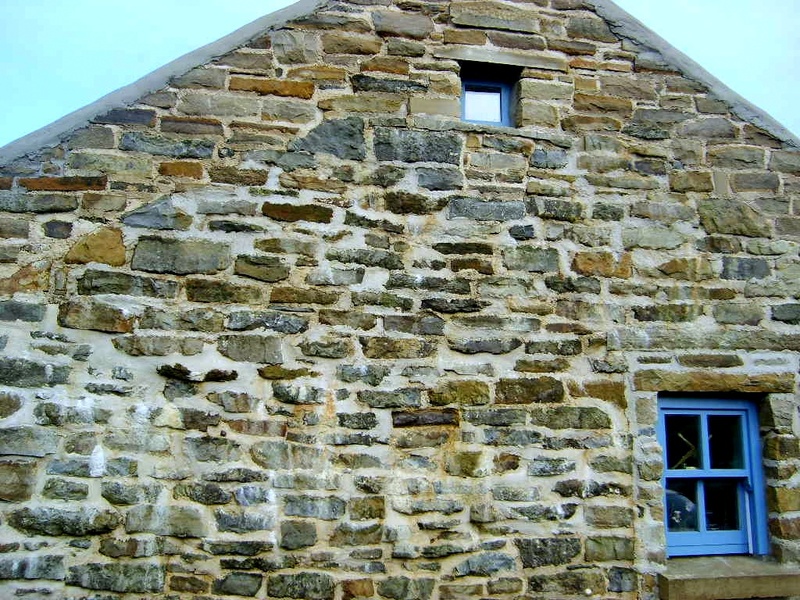 More to follow on the solution – but there exists a treatment that permeates the stone and bonds with it’s particles, while repelling water yet leaving the wall breathable, The breathability is vital for a building of this nature. The dryer the stone – the more deeply the application can penetrate. I’m worried about the lovely new timber being damaged meantime. Sorry to see that dampness is now providing a headache for you, Louise. Are you sure that the area under the small window is the source of the problem? 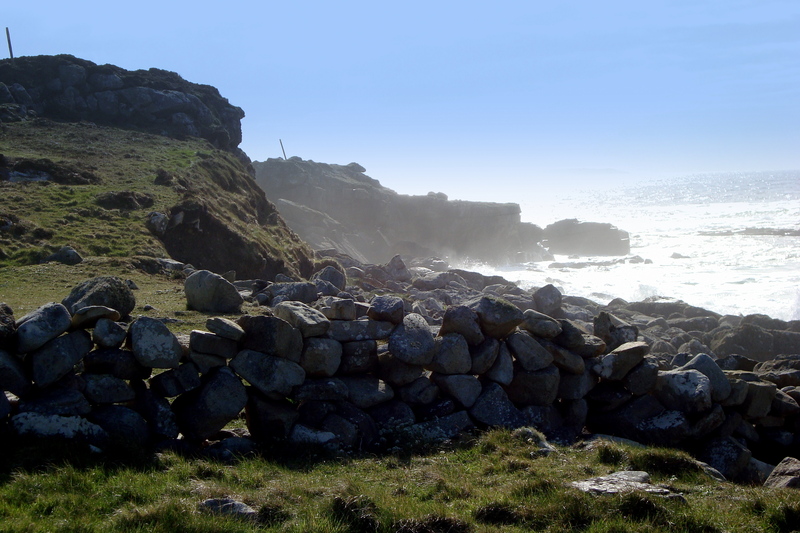 I ask this because, from your photos, the dampness is located in the corner, whereas the porous stones you refer to are high up in the centre of the gable. Is there a large area of the wall damp? When the weather permits, would it be feasible to remove these few porous stones and replace with new ones? The mortar between them should still be reasonably soft and easy to remove. Lime rendering and lime washing, (whitewashing), both inside and out may be required and this should improve the situation considerably. However, it is difficult to say what is your best course of action without actually seeing and determining the cause of the problem. I feel sure that Pat McAfee would be willing to offer his professional advice, he has considerable experience with this type of problem. Best of luck with it and Happy 2014. Please excuse me Louise, I didn’t see the earlier comments before I posted the above. Believe it or not, mixing cow dung with the mortar is supposed to be a good repellent of leaching soot!! Eddie – thank you & certainly I shall limewash the interior wall with a good whack of cow dung in the mix. I’d heard of this before – used to insulate chimneys in the past. As you rightly observe, the dampness photograph I’ve shown is of one corner area – however the damp area does extend to the whole wall made from old stone (beneath the small window.) Yes it is true – certain individual stones are more ‘spongey’ than others – but they are all from the same ancient lot. Up higher in the gable – where we have raised it by one foot – the new stone is utterly dry – and even the lime barge is perfectly protective. I’m afraid the elements have had their ‘way’ with this old stone, simply. But it is not beyond redemption! Blessing to you my friend, and to your own Louise for the new year. All the best to you too Mal – see you in Offally with any luck! Good luck with getting your damp patch sorted. So annoying when problems crop up. 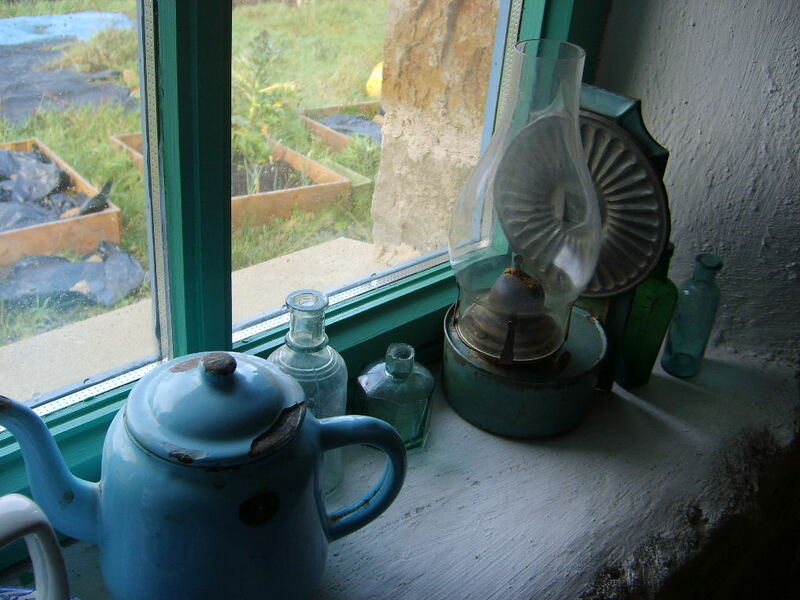 I have the same enamel teapot as you but in a darker blue. All good wishes to you and yours for the year ahead. I’m looking forward to more time for teapots and soft furnishings – as soon as the stuctural stuff is finally sorted. The homemaking part is always a joy. Best wishes Bridget for 2014. Bad luck on the leakage. It’s no coincidence that all of the historic cottages on this blog are either lime rendered, or have multiple coats of lime wash. 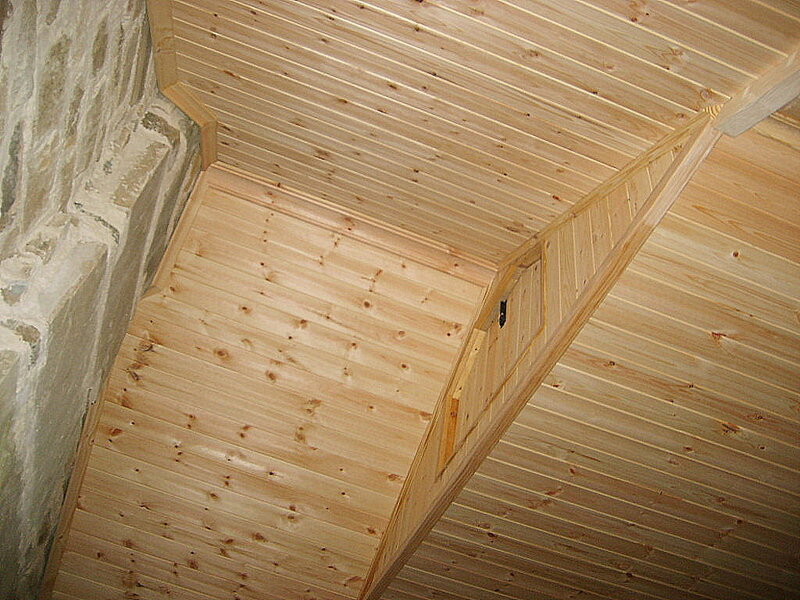 The latter being intended to flood-fill the micro cracks in any pointing and as an additional water-shedding coat. In the lake district traditional walling was also laid so that the outer face had its upper slope angled to throw water off the building – it might be that you just have a stone or two where the pointing has opened up and the angle of the stone encourages water to track through the fabric. It is planned, come summer, to render this gable – but I think you have something – with your suggestion that the angle of one or two stones may be allowing seepage through the fabric. Indeed I have noticed a slight concavity (not visible from the picture) in the area above and to the side of that sash window, where the leak is the worst. We’ve had fierce wet and stormy conditions with no respite – and the current condition of the inside wall is terribly wet. I decided today to cover the area as an emergency measure. Whether to render in summer or spray with the breathable sealant meantime, is a question for another day. Thanks for your observation.